This Drop-Arm Waterfall Hook for Gift Bag allows for high visibility and great tiered presentation of choices and styles on Pegboard. 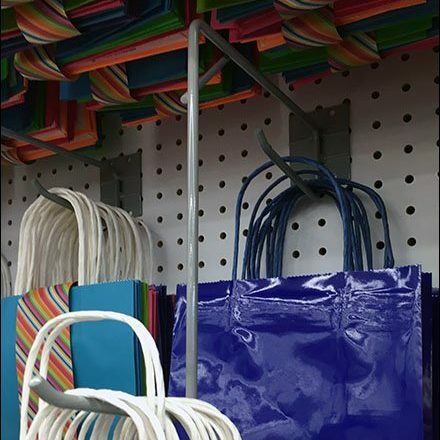 Scan Hooks were not necessary due to group discount pricing of the entire category at Five Below®. Step through the thumbnail and gallery for alternate views and closeups. Note the Heavy-Duty Backplate necessary to support the weight and resist torque. Scroll down for more Gift Wrap and Heavy-Duty Backplate posts.